Room Blocks for Your Romantic Chicago Wedding. When you reserve your room block at Kinzie Hotel, your friends, family, and bridal party will get the ultimate Chicago experience. With boutique accommodations, an amazing location in the heart of River North, and amenities designed for group travel, Kinzie Hotel creates a lively, welcoming atmosphere to help set the tone for your magical Chicago wedding. When you reserve your wedding block at Kinzie Hotel, your guests get the VIP treatment. Whether you want to leave welcome bags at the front desk for your guests or you want us to add welcome amenities like wine, Garrett's popcorn, or Chicago City Passes to your guests' rooms, Kinzie Hotel will go above and beyond to deliver a truly memorable travel experience. Kinzie Hotel requires at least 10 rooms to secure a block of rooms. To provide a truly special, tailored wedding hotel experience, we recommend contacting us six to 12 months before your big day. Once we know the dates of your wedding, how many rooms you'll need, and any additional requests, we'll provide you with a written proposal. Chicago starts here, and your guests will have unbridled access to River North during your wedding weekend. With hundreds of great bars, restaurants, and attractions just outside our front doors, your friends and family will have boundless opportunities to reconnect, relax, and recount stories. River North is Chicago's bachelorette weekend destination, and Kinzie Hotel puts you in the middle of all the action! 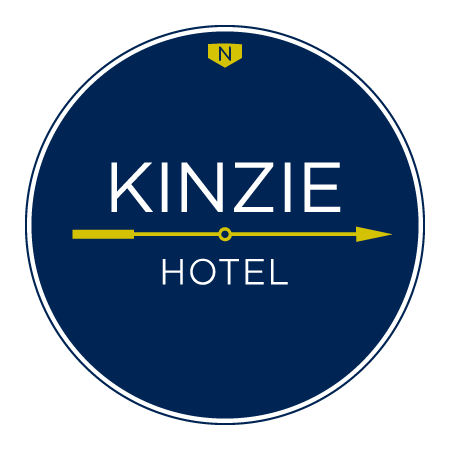 Just steps from Three Dots and a Dash, Howl at the Moon, the Baton Show, and other party hot spots, you and the ladies will have everything you need at Kinzie Hotel. With boutique accommodations with blackout curtains, large bathrooms and mirrors for getting ready, and great bloody Mary’s next door at Public House, Kinzie Hotel provides the perfect home base for an epic bachelorette party. Reserve Your Wedding Room Block at Kinzie Hotel! Get in touch with Kinzie Hotel's friendly, experienced, and accommodating team to reserve a block of rooms for your big day! Give us a call at (312) 395-9000 or fill out a quick, easy contact form to get room pricing and availability for your big wedding!